Fredo, ¿qué pasa? Five short stories featured on various segments of the DVD/video. 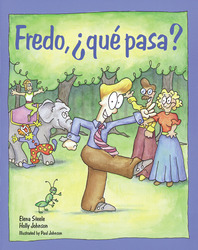 Stories feature the lovable character Fredo and his daily routine, his adventures going on a picnic, his family, going to the circus, and getting sick. Created for reading practice and vocabulary reinforcement, these original stories reuse concepts and themes introduced in the DVD/video lessons. The 64-page storybooks are available for purchase so that the children can read the books themselves.